Autism (AW-tiz-um) is a brain disorder that affects a person's ability to communicate with and relate to other people and limits the person's interests and activities. Like many children with autism, Jamie was concerned with order. Even as a young child, he kept his toys in the exact same spot on his shelves and would become very angry if anything was moved. He might throw toys, break dishes, or even kick his mother. Most of the time, though, Jamie ignored other people. He seemed to live inside his own head. When things became noisy or confusing in the real world, Jamie would bite himself until he bled. When Jamie started school, he was put in a special class where things were calm and his activities were carefully planned. By the time he was 14, Jamie seemed more relaxed. He would talk to others if they talked to him first. He was also taking medicines that helped him control his anger. However, he still liked everything to be orderly. 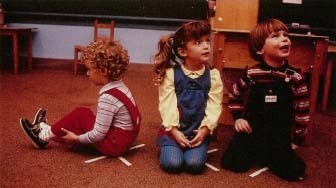 Three autistic children in school in Pittsburgh, Pennsylvania. Two are interacting with an adult who is outside the photograph. © Andy Levin, Photo Researchers, Inc.
unable to understand other people's thoughts, feelings, and needs. In many cases, language and intelligence are affected, and people with autism may have a limited number of interests and activities. Many people with autism repeat the same actions, such as rocking or twirling their hair, over and over. Some hurt themselves by banging their heads or biting their arms. Others seem painfully sensitive to touch, sound, taste, or smell. They may strongly dislike any form of physical contact. Children with autism may refer to themselves by name instead of "I" or "me." Some speak in a singsong voice. Studies suggest that autism may result from problems before birth that keep the brain from developing normally. The brain of an unborn baby starts out with just a few cells that grow and divide until the brain contains billions of special nerve cells, called neurons (NOOR-ons). Each neuron sends out long fibers that connect with other neurons to pass signals from one part of the brain to another or from the brain to the rest of the body. When a neuron receives a signal, it releases chemicals called neurotransmitters, which send the signal to the next neuron. Studies of people with autism have found that some of their neurons are smaller than normal. They also have short nerve fibers, which may affect signaling. In addition, studies suggest that people with autism may have an unusually high amount of the neurotransmitter called serotonin (ser-o-TO-nin). Scientists are studying the effect of such differences. Autism occurs in people all over the world of every race and background. Estimates are that two to ten out of every 10,000 people have autism. If the milder forms of autism (see PDD sidebar) are included, this number can go as high as twenty in 10,000. Males are three to four times more likely than females to have the disorder. However, girls with autism tend to have more severe symptoms and lower intelligence. Genes * may play a role in autism. Families who already have one child with autism have a greater risk of having a second child with the disorder. However, autism does not seem to be caused by one particular gene. Some scientists think that autism may be due to a cluster of faulty genes. In most cases, these genes cause only mild symptoms, such as reading problems, but under certain conditions, full-blown autism may result. Recently, it has been recognized that there is a range for autism—from severe to relatively mild. The term "pervasive developmental" refers to milder cases that do not have all the signs of autism. People with PDD all have some degree of delayed or abnormal language, difficulty with social interaction, and some unusual behaviors or perseverations (overfocus) on ideas or actions. * genes are chemicals in the body that help detemine a person's characteristics, such as hair or eye color. They are inherited from a person's parents and are contained in the chromosomes found in the cells of the body. What Other Disorders May Occur? Mental retardation. Many people with autism are mentally retarded to some degree, which means that their intelligence is well below average. Seizures. A seizure is a sudden burst of uncontrolled electrical activity in the brain that can result in brief blackouts to convulsions (intense, uncontrolled muscle spasms throughout the body). About one third of children with autism have seizures, which can be controlled with medicine. Fragile X syndrome. This disorder is associated with a faulty X chromosome * . About one out often people with autism, mostly males, have fragile X syndrome, which causes mental retardation. Asperger's syndrome. Children with Asperger's syndrome, considered a mild form of autism, have a consuming interest in, or obsession with, one subject—often something unusual for their age. They generally have average or above-average intelligence and impressive verbal skills but lack nonverbal and social skills. The symptoms of autism can range from mild to severe. In some children, hints of future problems are apparent at birth and become more noticeable as the child's development lags behind that of other children. In others, everything seems fine at first, but between eighteen months and three years of age, the child starts to reject others and may seem to slip backward in development. Healthy babies look at other people's faces and react to sounds. Babies with autism avoid eye contact and seem unable to hear. They may start making speech sounds, then suddenly stop. About half of people with autism are never able to speak; others may start talking as late as age five to eight years. Those who do speak often use language in unusual ways. For example, they may say the same thing over and over or speak only in single words. Some children with autism have echolalia (ek-o-LA-lee-a) and only parrot back what they hear. Some speak in a singsong or robot-like voice. People with autism also have trouble communicating with body language. Most people smile when talking about things they like or shrug when they cannot answer a question. People with autism often do not use their faces and bodies in this way, and their tone of voice may not indicate their true feelings. Usually, babies smile at familiar faces, and past the age of 7 to 9 months they show signs of fear around strangers. Babies with autism act as if they are unaware of the comings and goings of other people. They may seem impossible to reach. Some resist hugs and cuddling. Others accept physical contact but do not hug back. Older children with autism rarely seem to seek love and comfort from others. Children with autism also have trouble understanding what other people are thinking or feeling, and they are unable to see things from someone else's point of view. * X chromosome (X KRO-mo-som).A chromosome is a structure inside the body's cells containing DNA, the genetic material that helps determine characteristics, such as whether a person has brown hair or blue eyes. The X chromosome carries many different genes. Females have two X chromosomes, while males have only one. Babies are fascinated by the world around them. They reach for objects and play with toys, constantly moving from one thing to another. Babies with autism often seem stuck on one activity. They may repeat one movement, such as rocking back and forth or flicking their fingers. Children with autism may also become obsessed with certain objects. For example, a child who is obsessed with watches might grab strangers' arms to look at their wrists. Many people with autism seem painfully sensitive to touch, sound, taste, or smell. They might cover their ears and scream at the sound of a vacuum cleaner. Other senses may be extremely dull. Some children with autism do not seem to notice extreme cold or pain, to the point where they might break an arm and never cry. Some people with autism have remarkable talents. For example, at an early age, when other children are drawing lines and scribbles, some children with autism can draw detailed, realistic pictures. Other children learn to read before they even start to speak. Still others can play a song on the piano after hearing it once. A few people with autism can even memorize whole television programs or pages of the phone book. Since the symptoms of autism vary so widely, it can be hard to diagnose. Parents are usually the first ones to notice that something is wrong. A doctor can rule out problems such as hearing loss, speech problems, mental retardation, and other brain disorders. If autism is suspected, the child can see a specialist. There is no single test for autism. The doctor will closely note the child's language and actions around other people and ask the parents about the child's symptoms and development. The term "autism" was introduced by the psychiatrist Eugen Bleuler in 1911 to refer to a group of symptoms observed in people with schizophrenia. Bleuler described the symptoms as "detachment from reality," with a "predominance of inner life" withdrawn from the external world. The Johns Hopkins psychiatrist Leo Kanner (1894—1981), founder of child psychiatry as a medical specialty, first identified autism as a disorder distinct from schizophrenia. Kanner believed that people with autism had not withdrawn from participation in the external world, but that autism was a fundamental inability to relate, from the beginning of life. In 1944 he designated the condition as "early infantile autism." Temple Grandin is a gifted animal scientist who has earned a Ph.D. Today she invents equipment for handling livestock, writes books, and gives lectures. Yet as a child, Grandin had many of the signs of full-blown autism. As a baby, she would stiffen when picked up and struggle to be put down. By age two, she was sometimes overpowered by her ultra-sharp senses. She screamed, flew into rages, and threw things. At other times, she found that focusing intently on one thing, such as an apple or her hand, made herfeel calmer and safer. Grandin's mother put her in a special class with strict routines designed for children with speech problems. By age four, Grandin had started to speak, and by age five, she could go to regular school. As an adult, she recalled her experiences in a book called Thinking in Pictures. The book begins: "I think in pictures. Words are like a second language to me." Today Grandin uses the way her brain works to imagine how the parts of the complicated equipment she invents will fit together. There is no cure for autism, but there is reason for hope. Some treatments focus on using rewards to teach new skills, then using the new skills to replace problem behaviors. Others build on the special interests, skills, and needs of the particular child. Studies have shown that such treatments are most likely to work if they involve a regular routine and planned activities and teach tasks as a series of simple steps. It also helps if the parents are involved, and with training, parents can continue the treatment at home. No medicine can fix the brain problems that seem to cause autism. However, doctors may prescribe medications to reduce symptoms such as head banging or violent outbursts. Some medications also decrease seizures and lessen problems related to paying attention. Most such drugs affect the amount of signaling chemicals, such as serotonin in the brain. Special education classes can help a child with autism learn as much as possible. For some, this means mastering simple skills such as dressing and handling money. For others, this means learning to read, write, and do math. Many people with autism finish high school, and a few even earn college degrees. The sooner a child gets help, the greater the chance for learning. People do not outgrow autism. In general, those with milder forms (PDD) do better in their day-today lives. Over time and with help, however, the symptoms of autism may get better. Although most adults with autism need lifelong training and help taking care of themselves, some go on to lead nearly normal lives. In the movie Rain Man, actor Dustin Hoffman portrays a man with autism who is a savant, or a person with mental deficiencies who is exceptionally gifted in one area. To prepare for the role, Hoffman studied real-life "rain man" Joe Sullivan. Like Sullivan, Hoffman's character insists on eating cheese puffs with toothpicks and mutters the same things over and over to himself. Also like Sullivan, the character can do complicated math in his head and name the day of the week for any date past or future. When the movie came out in 1988, Sullivan was a high school graduate who held a job shelving books at a library. Grandin, Temple. Thinking in Pictures, and Other Reports from My Life with Autism. New York: Vintage Books, 1995. Autism Research Institute, 4182 Adams Avenue, San Diego, CA 92116. A group that studies autism. Autism Society of America, 7910 Woodmont Avenue, Suite 300, Bethesda, MD 20814-3015. A group for people with autism and their families. U.S. National Institute of Mental Health (NIMH), NIMH Public Inquiries, 5600 Fishers Lane, Room 7C-02, MSC 8030, Bethesda, MD 20892-8030. NIMH publishes a pamphlet called Autism.